TORONTO, Ont. (November 22, 2017) – The Barra MacNeils, one of Canada’s favourite bands, will bring a taste of Christmas on the East Coast to the heart of Toronto just in time for the holidays. Known as Canada’s First Family of Celtic Music, the five MacNeil siblings will perform “An East Coast Christmas” at Roy Thompson Hall on Thursday, Dec. 21st as part of a cross-country tour, continuing a national holiday tradition that has entertained millions of concert-goers over the past 15 years. Hailing from Sydney Mines, Cape Breton Island, Nova Scotia, the Barra MacNeils are deeply rooted in Celtic music, culture, dance, language and history. Over the course of 30 years performing together, the family band has earned a reputation as one of the greatest live concert acts in the Celtic world. Families around the world love the passion and artistry they bring to the stage, featuring multiple lead vocalists, beautiful sibling harmonies and prowess on a wide variety of acoustic, stringed, percussion and wind instruments. Their live shows blend dancing, storytelling, Gaelic songs and an unforgettable journey through an ancient culture. This is the 15th year in a row that the Barra MacNeils will perform their East Coast Christmas show for audiences across Canada. The show includes a musical potpourri of traditional MacNeil family favourites from Christmas ceilidhs, midnight masses and seasonal celebrations. Thousands of fans are expected to attend the holiday performances in more than 25 venues prior to Christmas, including the Toronto show. 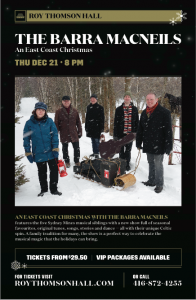 To book tickets for the Barra MacNeils’ East Coast Christmas on Dec. 21st at 8 p.m. at Toronto’s Roy Thompson Hall, please click here. About the Barra MacNeils: Multi-award winners and Canada’s Celtic ambassadors, the Barra MacNeils have released no less than 17 recordings. They continue to perform to sold out audiences throughout Canada, the United States, the Caribbean, the United Kingdom and Europe. From headlining major festivals, concerts, special guest appearances (Rita MacNeils CTV Christmas Special, performing with The Chieftains) television specials, film and television placement (Men with Brooms Soundtrack; Racket In The Attic) and their annual Christmas tour, they have set the course with a solid foundation for success.